A Year-End Toast to Our Guests! We wish all of our Italy Perfect clients a lovely holiday season and a toast to your wonderful Italy Perfect 2015 travel moments. We are honored that you chose Italy Perfect to help you with your Italy accommodations. We celebrate your happy Italy moments, important events and major milestones that included marriage proposals, elopements, anniversaries, graduations, retirements, good medical news, family reunions, birthdays, new jobs and just because you, like us, love visiting Italy. We sincerely thank you for your business and we look forward to 2016 and your return. Music is woven through the life and history of Venice. A concert or an opera is a wonderful way to deepen your enjoyment of this lovely city. Enjoy fine music in unique and intimate settings at Musica a Palazzo. You can choose your opera, based on the day of the week and then move from room to room for different parts of the performance in a fascinating noble palace. 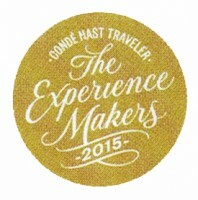 Condé Nast Traveler magazine has recognized Lisa and Pat Byrne of Italy Perfect as “Experience Makers 2015”, a curated list of the best travel experts in the world that they they trust. Italy Perfect was selected for vacation rentals in Italy. The December 2015 CN Traveler “Experience Makers” article honors the best-of-the-best for professionalism and attention-to-detail. “We are delighted to be chosen as one of CN Travelers 2015 Experience Makers for 2015 and we thank our guests for the opportunity to make their travel to Italy memorable”, said Lisa Byrne. “We so appreciate such important industry recognition of our expertise”, added Pat Byrne.